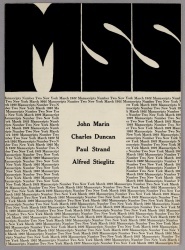 MSS (Manuscripts) was a magazine edited by Paul Rosenfeld, Alfred Stieglitz and Herbert J. Seligmann and published in 6 issues in New York between February 1922 and May 1923. MSS 1 (Feb 1922). 26 x 18,5 cm. Download (20 mb). MSS 2 (Mar 1922). 26 x 18,5 cm. Download (10 mb). 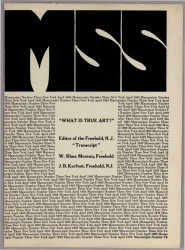 MSS 3: What is True Art? (Apr 1922). 26 x 18,5 cm. Download (6 mb). 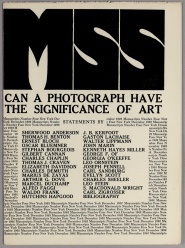 MSS 4: Can the Photograph Have the Significance of Art? (Dec 1922). 26 x 18,5 cm. Download (20 mb). 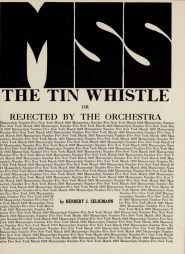 MSS 5: The Tin Whistle (Mar 1923). 26 x 18,5 cm. Download (17 mb). 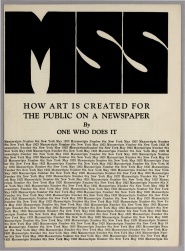 MSS 6: How Art is Created for the Public on a Newspaper (May 1923). 26 x 18,5 cm. Download (5 mb). Issue 4 in Iowa Digital Library. This page was last modified on 21 August 2014, at 09:15.